Classic fireplaces have something, that we could spend many hours sitting in front of them, staring at flames and just relax. However, not everybody could install such fireplace. 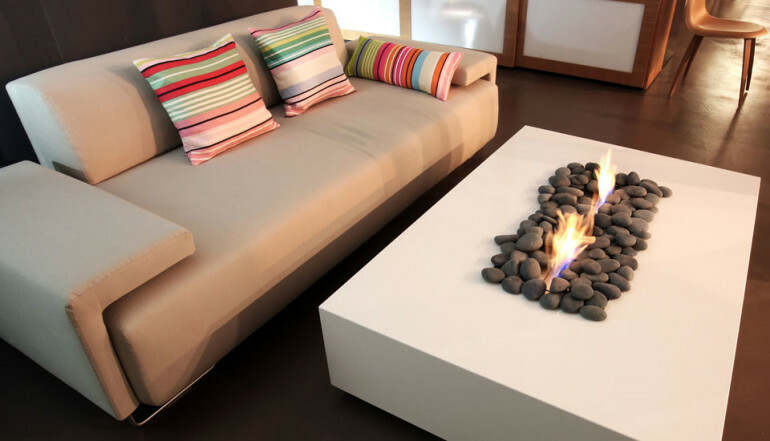 In this situation – buying bioethanol fireplace is a good idea. Bio fireplace doesn’t stand out from traditional one, it even has few more advantages. Fireplace is not only an additional decorative source of warmth in our apartment, but also great way to relax after hard working day. Gentle flames relax and calm down, let us go for quiet and forget, just for a while, about daily worries. Who doesn’t like long, winter evenings, passed in warm room with brightness of flames? Bio fireplaces are the alternative for everyone, who can’t or don’t want traditional fireplace. There are a lot of different models, so everybody will find something, conforming to its tastes and housing conditions. The big advantage is a fact, that there is no need to prepare everything earlier, bio fireplaces are ready to use at once, without any effort, so we save our time. Bioethanol fireplace are ecological devices, unlike the traditional ones, do not produce unpleasant smell and smoke, so it’s easy to keep them clean. There are also smaller models – to be placed on a table or commode. Due to it we get a wonderful decoration for our apartment, and cup of coffee by such table will be a great delight. If we prefer to spend our free time outdoor – it’s very simple. There are bioethanol fireplaces, looking like bar table, so we could enjoy the view of pleasant flame and also place additional things on a top. Such bio fireplace will be a perfect solution for a terrace, where we could drink some tea or summer drinks with our friends in the evening.